Mother’s Day is in just one week! If you’re like me, you struggle with what to buy the mom in your life that adequately communicates how special she is to you. And what do you buy for her without cluttering up her house with more trinkets? Several years ago, I stumbled on an idea that I found in a magazine. This was before Pinterest, and before Ann mentioned a similar idea on her blog. My sister and I got to work. My husband and his siblings made one for my mother-in-law as well. It is so easy, but so full of love! If you don’t have much time, this is still very doable. Best of all, I can’t tell you how many times my mom has mentioned that this is one of her most favorite gifts. What could be this great? A memory jar! The concept is simple. Write down on slips of paper any wonderful memories from childhood, family traditions, funny stories, things you love about your mom. One memory per slip. Have all your siblings do the same. Then, gather them into a pretty jar and present it to mom on Mother’s Day. The idea is that every day, mom will pull a slip out of the jar and read a memory. We tried to put enough in for one year of memories without repeating! How wonderful it is to honor our Mom in this way. I hope that in 15 years, when my children are out of the nest, that they will make a memory jar for me! I'm happy to be a contributor for a second year to help The Sparrow Fund's Build the Nest campaign. 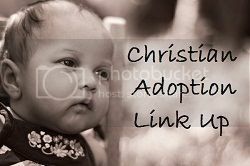 In this way, I am able to help other adoptive families, even while our family is in the journey! And so, if you purchase from my etsy shop in the month of May, you will be helping our family to adopt, plus blessing countless others through the work of The Sparrow Fund. Please visit their website for a complete list of partners. It's that time of year again. Most of us are making our lists and checking them twice. You know you're going to be spending money buying Christmas gifts anyway, so why not buy gifts that give… twice! What do I mean? You can spend your hard-earned money in a way that gives a beautiful gift to your loved one, while at the same time making a difference in the life of the artisan. How cool is that? I collect ideas all year on my pinterest board. This post will highlight just a few of them. Amazima Ministries in Uganda sells magazine bead jewelry made by the women there. When you buy from Amazima, you employ a Ugandan woman, feed a hungry child, and know that the women in the vocational training are receiving spiritual discipleship as well. Trades of Hope is another organization that "empowers women to create sustainable businesses worldwide." I have bought beautiful jewelry & scarves from this site before and have not been disappointed. Lovely craftsmanship. "Shop our products to help a woman feed her children. Inspire hope. Create change." All while getting your Christmas shopping done. Win-win! With a motto of "changing the world for one," what's not to love about No. 41? This organization employs 21 young women from an orphanage in Rwanda and 11 from the surrounding village. These women also give back to their community through a feeding program in local schools. Unique gifts, decor, and accessories that will give the artisan a job she can be proud of. What a great way to spend your money this holiday season! This is just a small sampling of how you can shop with a purpose this Christmas. I'm making it my fun challenge this year to see how much I can buy this way. Who's with me? Last month, I was contacted by Kelly to see if I would be interested in partnering with The Sparrow Fund in their Build The Nest campaign. I had never heard of this organization before, so I starting reading up about their work. I learned that this organization was founded by adoptive families who were changed forever by adoption and hope to see others embrace that "wonderful, life-altering" change as well. Practically, The Sparrow Fund helps adoptive families by providing training opportunities, grants, and programs designed to provide counsel and comprehensive medical reviews of their referred child. In the book of Luke, from the New Testament, we read, “Are not five sparrows sold for two pennies? Yet not one of them is forgotten by God. Indeed, the very hairs of your head are all numbered. Don’t be afraid; you are worth more than many sparrows” (Luke 12:6-7). In some places around the world, children in orphanages may be considered only as valuable as simple sparrows. But, God, because of His great love, has not forgotten any of them. Though the cause of the millions of orphans in the world may overwhelm us, God knows each one of those children and loves them dearly. Each one of us on the leadership team has a relationship with this God of the Bible. We believe that adoption was God’s idea. We were lost and orphaned, and God sent his son Jesus to provide a way for us to be adopted into His family. And, we desire to have a heart like His. We want to serve orphaned children by serving the families who are going to welcome them home. Our desire is that ONE MORE child will experience the love and belonging to a family and that there would be ONE LESS child living life with no hope. All this to say this... my etsy shop, 4onemore, has committed to supporting the work of The Sparrow Fund this month. Will you commit to shopping with a purpose this May? This is the time of year when you are searching for just the right grad gifts, wedding gifts, baby gifts, Mother's Day (and don't forget Father's Day is right around the corner too!). Check out this site which lists all those businesses that are partnering to Build the Nest. Get your shopping done and support a great charity at the same time! When I received Frontline International's Dispatches newsletter this week, I was so happy to read that a container of 60,000 Oromo Bibles reached Ethiopia in September! There was story after story about Christians celebrating that they finally had a Bible in their heart language -- something that we Westerners take for granted. Frontline is planning to send a second ship container of Oromo Bibles as their Christmas Project this year. There is still time for your family to make a donation toward this project. The cost of printing and shipping each Bible is $5. What a wonderful way to be a part of an Oromo Reformation, and give a lasting gift this season! I encourage you to head over to the Oromo Bible Project page and consider how you can have a part in this life-giving project. You could be the answer to a Christian's prayer... to finally have the Bible in their heart language! 'Tis the season of shopping... trying to find those gifts that will last even when the tinsel and lights are taken down. What is worth spending your money on these days? I am loving all the options for gift-giving that also help others, whether it's the widows, the orphan, mothers in Haiti trying to support their families, or other families who are also in the adoption process! 3 Cords is a social enterprise founded in September 2010 to train, employ, and empower Haitian women and their families. Our mission is to provide opportunities for physically handicapped women, and to show them that they are both beautiful and valuable. We do this by training the women as artisans in a loving, community oriented environment. When you buy a No.41 backpack, you are also providing a backpack for a primary school student in Rwanda. Backpacks are handmade by our new partnering women's co-op in Gisenyi, Rwanda. All bags are made with African iktenge fabric and standard Rwandan school uniform material. Friends that are adopting 2 children from China have started this online store with an ever changing selection of boutique style women's and children's clothes and accessories. We are currently helping Canadian and American families fundraise for their adoptions but have dreams of expanding in the future. When you make a purchase from our store, 50% of the proceeds will go our affiliate families to help with adoption expenses. Purchase for a Purpose: You can change the life of an orphan with every purchase from our store. Not only will the proceeds from your purchase help change the lives of some of our world’s most vulnerable children, by wearing these products you are raising your voice on their behalf! And, for that person on your list that really has everything, how about a donation in their name to the Oromo Bible Project? I remember when my great-aunt was in a nursing home and didn't really need anything, this was the type of gift that would have been meaningful. A gift in her name that would live past her earthly life. Another mom in the adoption process has put together a lovely board on Pinterest that has many, many additional ideas for super-creative gift-giving that will last past the season! Today I want to share with you an exciting opportunity to be a part of spreading the Gospel in Ethiopia! Considering we are in the process of adopting a little girl from that country, our family is making this our special Christmas project this year. Maybe you would like to be a part of this gift that gives too. Maybe you would consider donating money to the Oromo Bible Project this year. what is the oromo bible project? Oromo is one of the five most widely spoken languages in Africa. And the Oromo are the largest people group of Ethiopia. Unfortunately, the staggering truth is that only 1-2% of Oromo believers have the Bible in their language. There is a great need! The cost to print and distribute one Oromo Bible in Ethiopia is $5 USD. Frontline Missions International is joining with other partners to see that the Oromo people of Ethiopia have the Living Word of God in their hands! Will you help? Check out more information, plus a video on the Oromo Bible Project website or on the Frontline website. Will you be a part of spreading the light of the Gospel in Ethiopia?